Dean Karnazes changed the term to “runabout” where one has to run and alternately walk and then run again for the whole day and night or on a 12-hour period basis or shorter. When going on a “walkabout” or “runabout”, one has to bring some cash/credit card/ID and compact backpack where you can store windbreaker, dry shirt, socks, and cellphone. So, last Tuesday morning at 8:30 AM, I left the house with my Camelbak, some cash & credit card, two energy bars, ID, and my digital camera. I went northwest from our house towards the direction of Griffith Park. I initially walked on the sidewalk of the streets, stopping on cross streets and following the traffic lights and crossing along the pedestrian lanes. The Bald Runner in “walkabout” attire! It so happened that I was wearing TNF from head to foot! A pose at Mulholland Fountain & Park! I placed my camera on top of a road barrier and adjusted it to self-timer. The people inside their cars were smiling at me! 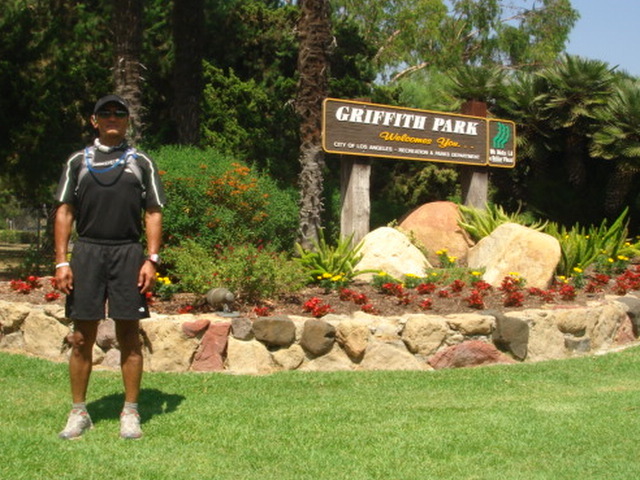 I entered Griffith Park at its Riverside Street entrance and I had some pictures taken at the Mulholland Park. 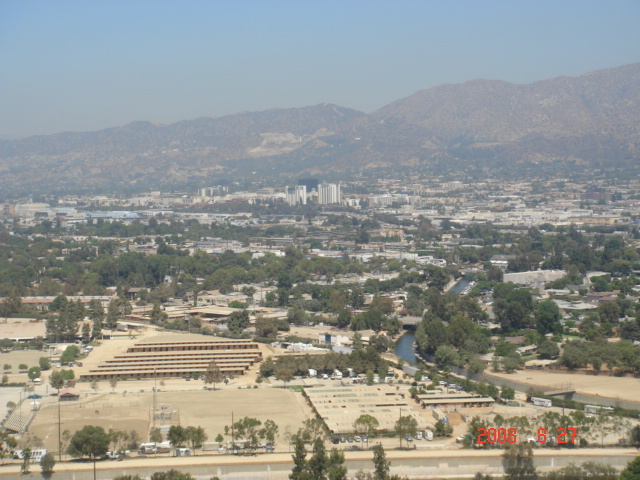 Mulholland is the Father of the Water Supply System for Los Angeles. I suggest you watch the DVD movie “Chinatown”. 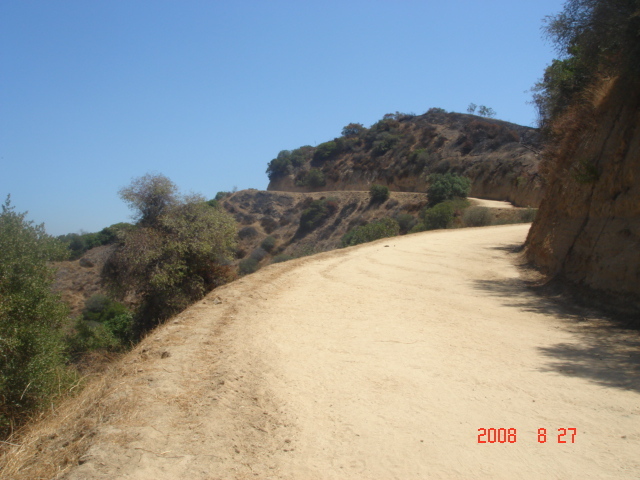 Once I entered Griffith Park and started walking along its horse/dirt trail but later I was enticed to run along the said trail. I ran at least 5 kilometers to break the monotony of walking until I reached the Old Train Station. I resumed my walking by taking the dirt trails towards the peak of the hills and mountains of the park where I saw at least six persons also walking along the trails. 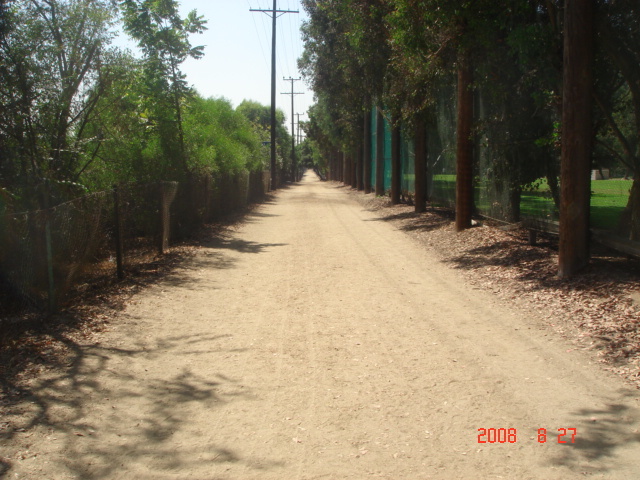 Jogging along the horse/dirt trail inside the Griffith Park. This is the route of the City of Angels Half-Marathon which is held on the 1st Sunday of December. On the right side is the Wilson’s Golf Course inside Griffith Park. There are lots of changes and improvements in the park since 1984 when I would come to the park at least three times a week to run on the asphalted bike lane of the park. After trekking the trails of the mountains on the east side of the park, I came down and ran towards the Golf Course and ultimately took the horse/dirt trail towards the Riverside entrance of Griffith Park. On my way back, I walked along Los Feliz Boulevard towards Atwater Village where I saw a Filipino Running Store called “A Runner’s Circle”. This store was recommended by Ben Gaetos for my running/ultramarathon needs. While inside the store, I was able to meet and have a brief talk with the owner, Joe Matias, from Bicol Region. This is the front view of the A Runner’s Circle Store along Los Feliz Boulevard. A pose with the owner of the store, Joe Matias (on the right) with his store staff, Daniela (at the middle) who is one of the top female runners in Los Angeles. My lunch, Subway’s Tuna Sandwich with unlimited Dr. Pepper’s Root Beer! I arrived at the house at 4:15 PM, had my post-stretching exercises and took a cold shower. It was a nice experience and the “walkabout” served as my recovery workout after the Bulldog 50K trail run last Saturday. I was able to cover a distance of 32 kilometers in my “walkabout/runabaout” for a period of 7:30 hours! This is cool. I have a similar idea of running and walking from my hometown to the city which is about 42kms. I think it will be fun. But credit cards aren’t accepted in the sari-sari stores along the road. Great read BR! I get to learn something new every day. Thank you for sharing all these new and wonderful experiences. Good evening, Sir Jovie. I’m glad that you were able to meet Joe at his store. It’s not a big store but service is top quality. They’ll spend time with you fitting the right shoes. If he does not carry the item you need, he’ll try to order it w/o extra or shipping charges. 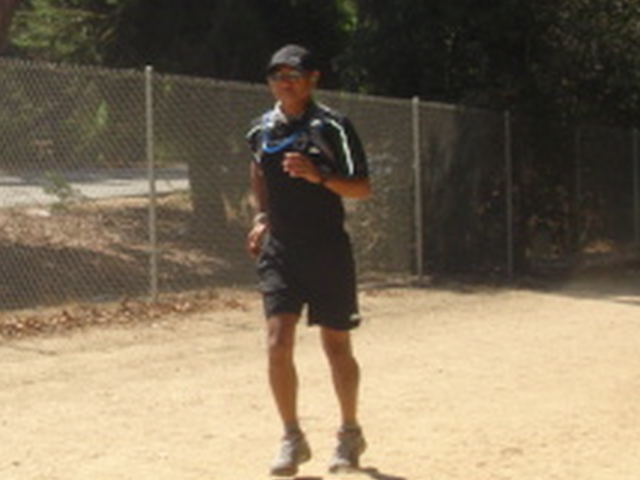 Joe also provides water stations at his store and along Griffith Park Trails for all runners in the area. Last year, I donated around 70 pairs of running shoes to his store. I collected those from my friends + my own too. Around 5 pm on weekdays, you’ll probably see top ultra runners train at the trails you run. That’s where I met Jorge, his wife Marie, “Flako” Mendosa, Emilio Martinez, etc. in ’01. The year after, I ran Bulldog. On weekends, they train at the AC100 course. 7.5 hrs is an outstanding recovery workout. Walking plays a very impt role at ultras. Even the top runners walk. You were right on observing about walking the uphills and running the downhills. I noticed that when I ran Catalina Mar in ’01. I followed a runner with a sign at the back of his shirt, “163 marathons + ultras”. I stayed close with him until I pulled away with 5 miles to go. You’re truly an inspiration, Sir Jovie. I may have ran a number of ultras but I still get the electricity from amazing runners like you. Cheers! !